Atlantic Lawn and Landscaping provides dune stabilization by planting American Beach grass and installing sand fence to help build the dune line. American Beachgrass (Ammophila breviligulata) American beachgrass grows naturally on the dunes that border the beach but does not grow in the rich soil of the inland marshes. 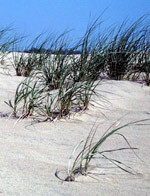 The beachgrass stands up well under the continuous salt spray and the summer heat on the dunes. On the hottest days, the leaves curl inward to reduce the area exposed to the sun and conserve moisture. With its roots going down to the freshwater table below the dunes and its horizontal runners spreading out under the sand around it, the beachgrass stabilizes the dunes. We recommend spacing beachgrass in an 18" x 18" grid pattern. However, many of our customers choose to space the plants closer together, reporting a 10" x 10" pattern looks better. For large areas, where planting will extend over a period of seasons, it is usually best to start on the windward side first. Over the years we have found the key to a successful planting, is planting when soil conditions are their best, early in the winter or late fall when the weather is cool. I've always found a planting depth of 8-10" is optimum, so the buds at the base of the stem do not dry out. Planting deep will prevent plants from blowing out in a heavy wind and enough moisture should be present so when an opening is made with a poker, the sand will not run back into the hole. A narrow poker or planting bar will be used for hand planting. After planting, we firm the soil around the plants. We place 1 culm/plug per hole when planting a very large area , or place 2-3 per hole (strictly personal preference) when a dense stand is preferred. Fertilization is very important to successful establishment of beachgrass. In the absence of a soil test, we recommend about 25 pounds of 12-12-12 fertilizer per 1,000 plugs is suggested. This is equivalent to 500 pounds per acre. Fertilizer will be broadcast on the soil surface after planting. Beachgrass spreads by sending new shoots (rhizomes) under the sand. It grows in clumps/bunches which contain many culms/plugs, that may reach a height of two to three feet. Roots are usually NOT evident at the end of a plug of beachgrass. Roots will develop from basal nodes after planting! They will grow! A year or two after planting beachgrass, when all surface sand movement has ceased, adapted plants may be planted in the beachgrass. 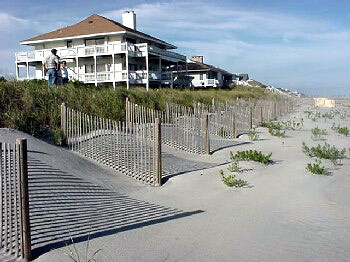 Sand fencing is an effective treatment in the important work of beach preservation and dune restoration. 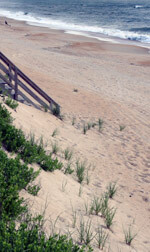 Periods of natural dune erosion occur when storm surge erodes the base of the dune and carries that sand to offshore bars. Sand fence provides an environmentally friendly system that promotes the retention of sand reserves created by beach reclamation and restoration projects and supports on-going sand dune maintenance programs. Our sand fence not only protects beaches from natural erosion, it also provides a vegetation prevention barrier for the safe habitat of natural sea vegetation and dune ecology. 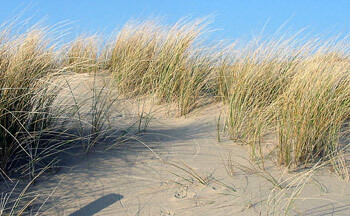 We install sand fence at the toe of the dune, spaced properly and angled correctly. The fencing must be no taller than 5 feet and built from evenly spaced thin wooden vertical slats connected with twisted wire. The fencing must be placed as far landward as possible to avoid interference with sea turtle nesting, public access and use of the beach. It must not be placed on the wet-sand beach. If fencing is to be placed waterward of the crest of the dune, it must be installed at a 45-degree or greater angle to the shoreline. Each section of fence must not be longer than 10 feet, and sections must be spaced at least 7 feet apart. Sand fencing to be placed along public accesses may be as long as the access, and may include a 45-degree funnel on the waterward end. The funnel may extend up to 10 feet beyond the end of the access. Planting when soil conditions are at their best, usually in early winter or late fall when the weather is cool provide the best results.